« I think that all my works relate to nature, consciously or unconsciously. 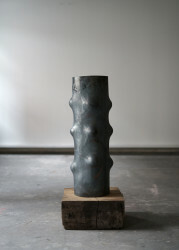 Galerie Maria Wettergren is pleased to present the Jakob Jørgensen exhibition TOTEM, from March 28 to May 18, 2019. 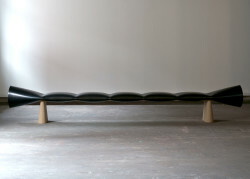 The exhibition presents a selection of ten unique or limited edition works at the intersection between furniture and sculpture, handmade by the artist in wood or iron. One of the pivoting points of the exhibition is the column, which Jakob Jørgensen never seems to stop deconstructing in various ways. Two major sources of inspiration lie behind these works – Constantin Brancusi’s Endless Column and Joern utzon’s Opera House, in both of which a dialogue between the geometrical and the organic is orchestrated. Jakob Jørgensen’s new large-scale sculptures and lightings in iron are truly impressive, and their physical impact is challenging both the artist, while making them, and the spectator. By heating the iron tube up to 1000 degrees Celsius and forming it with a pressure of 100 tons, Jørgensen manages to give the metal tube unexpected fluid qualities. 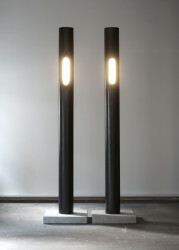 By the deformation of the metal tube, new sculptural dimensions gracefully emerge from the hard material. 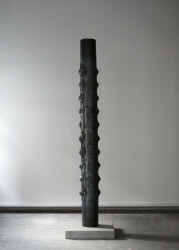 The tube sculptures are interesting in that when the cylinder, which is a geometric basic form, is deformed, all possible organic forms start occurring, such as tree buds or the shape it makes when it gets a sore in the bark and starts to encapsulate the wound. A similar dialectic between geometrical and organic form seems to be at stake in the different chest of drawers, entitled Fjäril, delicately sculpted in Oregon pine or oak. « Fjäril » means butterfly in Swedish, and indeed the chest of drawers seems to poetically paraphrase the transition from pupa to butterfly, through its closed geometrical form to its open, scattered shape. Through these various works, Jørgensen constantly seems to unveil how the organic lurks just behind the geometric. 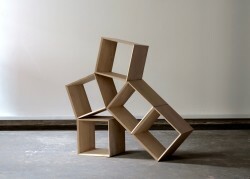 Another principle of metamorphosis is explored in the modular bookcases, Arca, in which Jørgensen proposes a multitude of geometrical shapes, by repeating and connecting smaller elements of the same geometrical form over and over again. 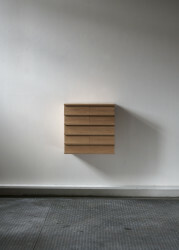 Totem is Jakob Jørgensen’s first solo exhibition in France.